You might be thinking, “Google what now?” Google Search Console (also known as Google Webmaster Tools) is a free service you can use to make sure your website is indexed in Google. This is important so that your site’s pages show up when people search for related topics in Google! 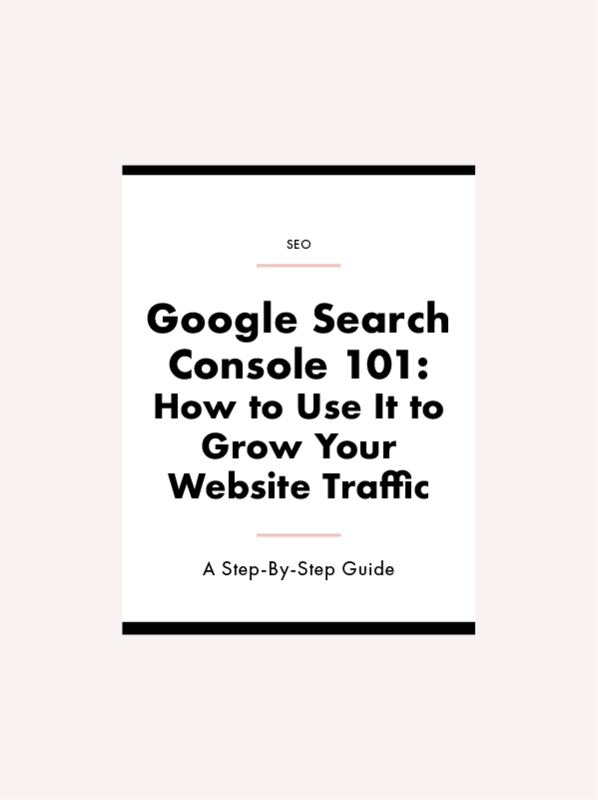 When you’re launching a new website, you need to add it to Google Search Console. If you already have a website, use Search Console to make sure it’s indexing properly. In this post, we’re going to explain how to setup your site on Search Console, what each section of the tool does, and why this is important and worth your time in the first place. To add your site, you will need a Google account, which is either your @gmail.com email address, or your @companyname.com email address if you use GSuite to manage your email. Enter your website in the box, like http://yourwebsite.com, and click the red “Add a Property” button. You’ll be taken to a screen to verify that you own the website you say you do. There are several different ways to verify your website. You can login to the company you bought your domain name from, or click on “Alternate methods” to see other ways. Personally, I find verifying with a Google Analytics account the easiest method. 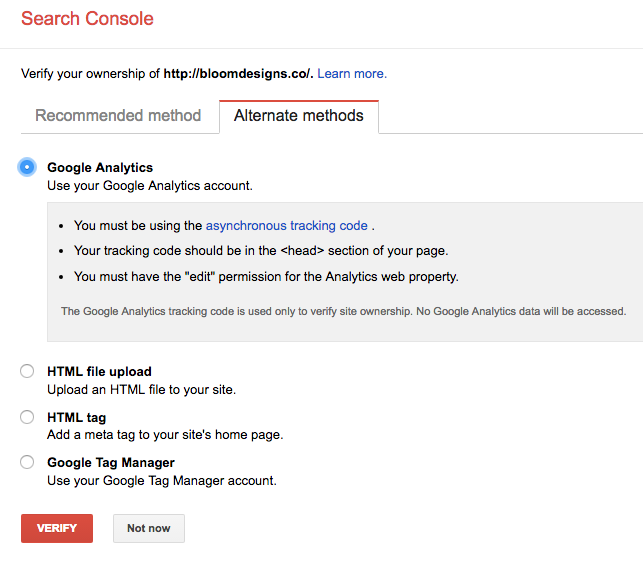 So click on “Alternate methods,” and select the “Google Analytics” option. Keep in mind for this to work, the email address you used to login to Search Console must also have access to your Google Analytics account. If this method doesn’t work for you, you can also choose the “HTML file upload” method. This is very easy. Google will give you a file to download and all you have to do is upload that file to your website. Once you’ve uploaded it, just click the red “Verify” button at the bottom of the page. Without verifying your site, you won’t know if all of your pages are indexing properly or not! This means someone could type in your exact business name and not even find your website. In most cases, Google still indexes sites that aren’t verified with Search Console, but why take the risk?! Plus, it gives you information about your site you can use to attract more visitors, which we’ll cover in the next section. This gives you an overview of your website’s search health at a glance, including how many pages have been indexed and if you have any errors that need to be fixed. At a glance, you can tell if anything is wrong with your site. This could be how many 404 pages you have, and what the broken links are so you can fix them, or a missing Robots.txt file. Whatever the issue, the dashboard will tell you about it. This section is pretty advanced, and covers things like your structured data, rich cards and Accelerated Mobile Pages (AMP). If you’re using those services, feel free to explore this section. Beginners don’t need to worry about this area! This is a pretty advanced section, but very powerful. Accelerated Mobile Pages serve up different versions of your site for mobile users, optimized for their experience, and can improve your search ranking. This section is really important! The Search Analytics tab (shown below) tells you how often your website came up in search results, and the average page position. This can help you find your most popular content for bringing in new users. You should frequently check the Mobile Usability tab to ensure your site is displaying and performing well on mobile devices. Any errors will show up here. Google gives higher rankings to mobile-optimized pages as of May 2016, so keep an eye on this page! These tabs tell you a lot about how people are seeing your website, both on desktop and mobile. Looking at Search Analytics tells you your average rank and the keywords people typed in to find you. Then, you can take those keywords and use them in your content as another piece of your SEO strategy. For Mobile Useability, it does what it says: ensures your mobile visitors (which are about half!) see things error-free. This tab shows you how many pages have been indexed by the search engine over time. You want to make sure the field “Blocked by Robots” is always zero! Seeing how often your site is indexed and how many pages are in Google’s index is important. See the blue line above? If that suddenly takes a nosedive from over 150 pages being indexed to like, 20 pages, you know something is up, right? Think of it like taking the temperature of your site’s SEO. This section needs the most attention of all, and you should check it at least monthly. Under Crawl Errors, make sure you fix anything that pops up. Since last month, I have one Soft 404 error, which means a page on my site couldn’t be found. Once you’re sure you’ve corrected the error on your site, mark it as fixed on this page. Under the Sitemaps tab, you’ll find out how many pages of your site have been indexed by Google. You want to submit a new sitemap at least once a month here. Some platforms like Squarespace and Wordpress submit this information to Google automatically, meaning you don’t have to. Just make sure the date of your last sitemap submission is recent (within the past month at least), and if it’s not, submit a new one by clicking “Add/Test Sitemap” at the top of the page. Your sitemap’s URL is typically www.yourwebsite.com/sitemap.xml. It’s so important to stay on top of crawl errors! If Google can’t find a page, that means no one searching on Google for information will be able to find it either. Monitor and fix your errors regularly so your dream clients can find you with ease! We hope this helped explain one of the more technical aspects of managing your own website! Got a question about Search Console we didn’t cover? Ask us in the comments below!